ARET has been exhibiting at IBC for almost two decades since the event was held on the shores of Lake Geneva. For this 2018 edition, the company is presenting two brand new OB Vans in the outside exhibit area. IBC 2018 is just 2 weeks away! 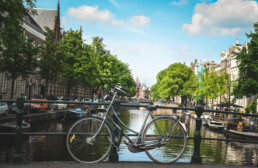 This is the time to schedule your meeting with the ARET team in Amsterdam. Join us for a personalized tour of some of the best OB Vans in the world, and don’t forget to find out more about all the latest projects. We look forward to seeing you at IBC 2018! Waiting for the upcoming 2018 edition, see what happened last September at RAI. See Aret Engineering’s Alessandro Asti explaining his latest big IP production TV truck, featuring Lawo V__matrix-based multiviewers and IP encapsulation, Lawo V__pro8 base-band glue, Ross video switchers, Lawo mc² audio consoles and the Lawo VSM IP broadcast control system. The V__matrix and V__pro8 units significantly reduce the installation’s footprint reg. 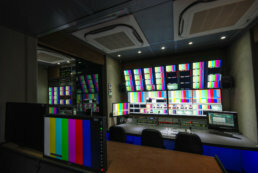 space, weight and power consumption – not the least issue to consider in broadcast truck design. 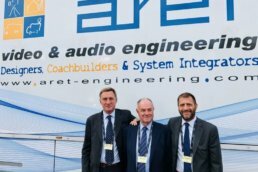 Don’t miss Aret Engineering at the upcoming IBC in Amsterdam, where the company will showcase two vehicles incl. 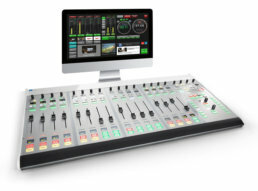 their brand-new on-air radio truck, featuring Lawo crystal & sapphire radio consoles and a full-blown studio with robotic cameras for visual radio applications. We would like to thank all our stand visitors for taking their time to visit our stand during Broadcast Asia 2018 in Singapore on 26-28 June 2018. We enjoyed meeting you and we’re glad that you had the chance to see all our latest projects and the new products on the market. Also, we are pleased that you had the opportunity to discuss your current business and future perspectives. Please do not hesitate to contact us at info@aret-engineering.com for any questions or further information. 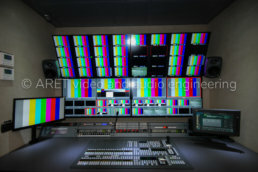 Also, ARET is presenting all its latest projects for OB Vans, TV / Radio Studios, MCRs and much more. If you want to meet, please contact our team for arranging a meeting. We look forward to seeing you at AES Milan 2018! Themed “The Power of Sound,” the 144th International AES Convention will bring together audio professionals, students, enthusiasts and advanced audio technologies from around the world for four days of audio immersion, experiences and networking. 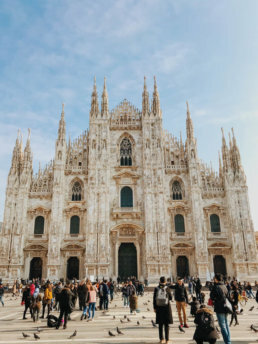 Register now for AES Milan at aeseurope.com for Advance Registration rates through 14 May, including additional discount pricing for AES Members and students. Complimentary Exhibits-Plus badges are also available by using code AES144NOW at checkout. This 3G truck has been designed for eight to ten cameras and is expandable on one side. 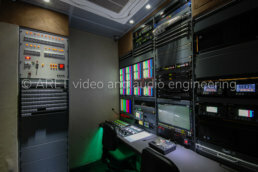 The inside of the OB van is divided into four different areas that are separated using sliding glass doors: engineering and CCU, production, sound and a voice-over booth. Sharjah TV recently took delivery of an OB van from ARET for sports coverage and other demanding productions. The Italian broadcast systems integrator ARET has supplied 450 OB vans over four decades since 1976, with several customers in the region, and this probably influenced Sharjah TV’s choice. 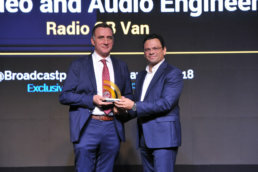 “ARET has been active for the past 15 years in the MENA region, and the Middle East is one of the leading markets for ARET,” comments Sales Engineer and Marketing Director Dr Eng Umberto Asti, who is also Vice President of ARET Video and Audio Engineering. As broadcasters require access to content no matter where they are, the mobile unit is now less of a workhorse of equipment and racks, and much more of a creative hub where broadcast technicians can focus on better engaging audiences through innovative live coverage. In response to the demands of the modern-day broadcaster, Dr Asti and his team at ARET created integrated workflows. “We did all the coachbuilding. Instead of buying a pre-made coachwork from third parties, as most of the other companies do, we are very proud to have our inhouse coachwork department that relies exclusively on internal resources. Our coachwork allows us to carefully monitor every single step of the creation process. We also did the designing and systems integration. Giving an overall perspective of the OB van, Dr Asti says: “This 3G truck has been designed for eight to ten cameras and is expandable on one side. 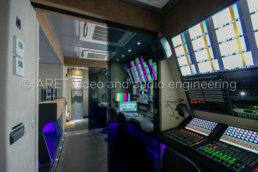 The inside of the OB van is divided into four different areas that are separated using sliding glass doors: engineering and CCU, production, sound and a voice-over booth. “It features a telescopic mast with a PTZ camera on top and a flexible layout that allows adapting to different types of productions. The robotic PTZ camera, installed on the top of a pneumatic telescopic mast, can be raised up to eight metres. 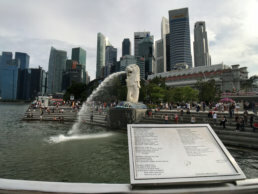 The pan-tilt head system incorporates a camera with 20x optical zoom that can supply high-resolution and high-magnification video in real time. The system is managed by an active control installed on the CCU desk that provides smooth transitions of the pan-tilt head. Despite all the buzz around live remote broadcasting, OB trucks will remain on the front line of production, especially when it comes to covering live events. Having an in-house coachwork department has helped the team at ARET to custom-design each van according to the client’s requirement, Dr Asti stresses – especially in the case of Sharjah TV, which requested a full expansion to be able to adapt its workflow to every type of event. The new 3G HD van joins a fleet of OB vans already with Sharjah TV. “This brand-new truck is a vital addition to their fleet that allows for the proper distribution of workload, optimisation of the overall workflow and significant improvement in video quality,” says Dr Asti. 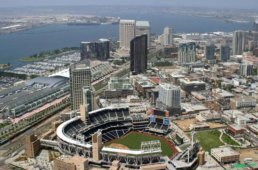 He explains that partnership with more than 30 broadcast brands has helped ARET “select the best equipment for every turnkey project”. “Most significantly, partnering with the major broadcast brands has enabled ARET to be flexible and cost-effective, allowing the customer a tailored configuration instead of an all-in-one brand solution. On the critical issue of testing and training, Dr Asti spells out the exacting procedure that ARET followed. “The first part of the training was carried out at our headquarters in Milan. We verified that the coachwork corresponded in all of its details to the project specifications. The same meticulous check-up was carried out for the broadcast and electrical systems. The whole system was then validated and tested together with all the supplied devices, always including the broadcast, electrical, air conditioning and hydraulic systems.  BroadcastPro Middle East is a monthly publication covering television and radio broadcasting technology as well as filmmaking trends in the Arab world. 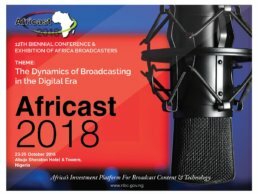 The magazine focuses on the entire broadcast chain from content acquisition and editing to media asset management, and playout and transmission across both traditional and new media platforms. Also, BroadcastPro ME is the official media partner for CABSAT, the region’s largest broadcast show. The Editor of BroadcastPro ME is also the only representative from the Middle East to be part of the jury for the IBC Innovation Awards. ARET is attending NAB Show 2018 at the Las Vegas Convention Contre from April 9-12. Come and join us for a personalized tour of our partner stands. ARET’s team is available to meet with you and your colleagues to show you all the latest products and broadcast technology solutions that will be presented in the upcoming week. All of this new products and services will soon be available to the customers to empower their production. If you want to meet, please contact our team for arranging a meeting. 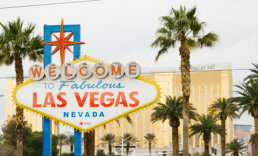 We look forward to seeing you at NAB Show! Waiting for the upcoming 2018 edition, see what happened last April at NAB Show 2017. Italian public broadcaster RAI, a long-time user of Lawo products and solutions, has just taken delivery of 37 Lawo V__pro8 8 Channel Video Processing Toolkits. The new Lawo equipment will be employed in a nationwide technical upgrade and renovation of studios and OB vans located all over Italy. System integrator and Lawo partner ARET Video and Audio Engineering, headquartered in Milan, won the tender after participating in a test procedure which scrutinized prominent brands’ ability to process video in broadcast environments. The RAI project is the latest in a number of successful joint projects between ARET and Lawo. Another notable project, from 2017, was the outfitting of Italian production company NVP’s OB4 OB Van. The heart of OB 4’s audio systems is a pair of Lawo mc²56 production consoles, a Nova router and DALLIS interfaces. The complete OB Van is controlled using Lawo’s VSM (Virtual Studio Manager) system; Lawo’s V__pro8 eight-channel video processing units give producers control of the complete broadcast production workflow using just 1 RU of rack space. Together, these Lawo systems deliver the versatility required for multiformat operation on Europe’s most challenging productions. 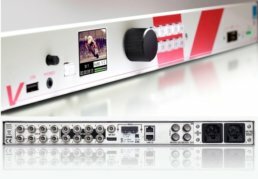 V__pro8 is a compact, fully digital eight-channel video processor with all of the “glue” features needed for today’s broadcast production workflows. It works as a flexible matrix system: using its 8 x 8 video matrix and 384 x 384 audio matrix, it is possible to switch any signal to any other. A modern GUI (based on HTML5) provides an intuitive interface for fast handling of day-to-day work. V__pro8 connects differing video formats, with high quality format conversion, color correction and audio embedding / de-embedding capabilities. 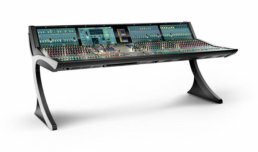 It also combines video and audio management, with a high-density MADI audio connection providing efficient video-to-audio bridging within the studio infrastructure. This combination of video and audio management in a single unit guarantees maximum operating efficiency by significantly reducing required space, wiring infrastructure and cost. Lawo designs and manufactures pioneering network, control, audio and video technology for broadcast and post-production, as well as live performance and theatrical applications. 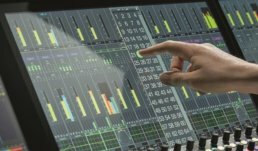 Products include control and monitoring systems, digital audio mixing consoles, routers, video processing tools as well as solutions for IP-based A/V infrastructures and routing systems. All products are developed in Germany and manufactured according to highest quality standards at the company’s headquarters in the Rhine valley town of Rastatt, Germany.